How do you distinguish opinions from facts on social media sites? 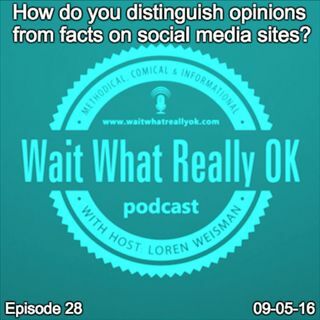 Wait What Really OK Podcast Episode 28 hosted by Brand Precision Marketing Strategist and Counselor, Loren Weisman, digs in to the options versus facts debate and how so many are prepared to state an opinion as fact before they really know the truth. Its not about doubting someone, its not about not trusting them, but in a world of lightning media, hype, rumors, hearsay and a world that truly makes it hard to ... Más informaciones distinguish the truth from the rumor, the deeper you dig to find the truth, the better off you are. The less you share things you are not 100% sure are true and the more you add the element of opinion to your statements, will also help you become that much more of a trusted source and trusted resource. How do you distinguish opinions from facts on social media sites? Ep28 of the Wait What Really Ok Podcast is available on iHeartRadio or on Spreaker. Podcast Blog Supplement for Episode 28 of the Wait What Really OK Podcast with Loren Weisman. Podcast Link Supplement for Episode 28 of the Wait What Really OK Podcast with Loren Weisman. Top five warning signs of bullshitters, scam artists and fakes. Podcast Video Supplement for Episode 28 of the Wait What Really OK Podcast with Loren Weisman. Podcast Photo Supplement for Episode 28 of the Wait What Really OK Podcast with Loren Weisman.